story by Tenaya Darlington, madamefromageblog.comForget about the sad, granular cement that comes in supermarket tubs. 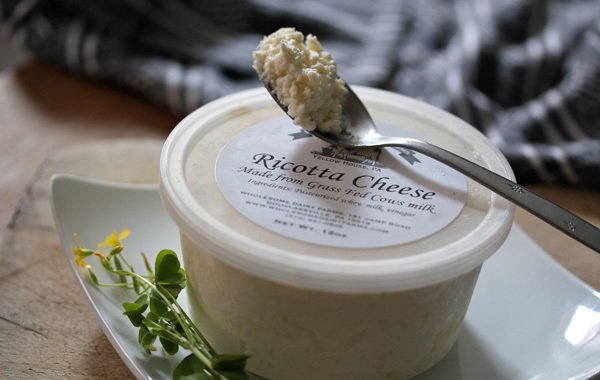 Fresh ricotta is feather-light, like the cheese Mark Lopez produces at his Wholesome Dairy Farms in Yellow House, Pa. Made from grass-fed milk, this stuff is dream-inducing. Take a spoonful, drizzle some honey on it, and you will experience double rainbows. That’s a promise. A veterinarian by training, Lopez gave up his clinical practice in 2007 to start his own small dairy. Lopez is most famous as the “Capogiro guy”—he supplies milk to the gelateria that has won the hearts and minds of Philadelphia dairy lovers. Today he milks 46 strapping bovines, and what he doesn’t sell at his farm store or to Capogiro, he’s using to make cheese. To jumpstart his new venture, Lopez began making whey ricotta this year, a labor-intensive process that involves heating whey and straining the fine curds. The result is airy, like the consistency of perfectly fluffed couscous. Try spreading it on a baguette and add a drizzle of olive oil, along with a pinch of salt and pepper. When you’re ready for your next course, load it onto berries or just scoop some into a bowl and top with dark chocolate shavings, orange zest and crushed pistachios. Ethereal. You may never need ice cream again.